IQS Directory is a top industrial directory listing of leading industrial dock lift manufacturers and suppliers. Access our comprehensive index to review and source aerial lift manufacturers with preview ads and detailed product descriptions. These dock lift companies can design, engineer and manufacture dock lift to your specifications and application need. A quick and easy to use request for quote form is provided for you to contact these aerial lift manufacturers and suppliers. Each company has detailed profile information, locations, phone number, website links, product videos and product information defined. Read customer reviews and product specific news articles. We are the right resource for your information requirement whether its for a manufacturer of dock lift platforms, hydraulic aerial lifts, elevated aerial lifts. Autoquip's dock lifts are manufactured by the designs of the industry's most innovative engineers. Our dock lifts are popular due to their assistance in faster loading, unloading, and pallet buildup and breakdown. Our full line of standard models and sizes fit most applications- but we also offer custom sizes and added options to enhance functionality. We are an ISO 9001 certified company, committed to providing you with long lasting, durable products that provide you with the highest overall value. Our dock lifts come with an extended warranty to prove their worth and increase your peace of mind. We work to make the entire process trouble free- from selection to usage. Please feel free to contact us! Bishamon works harder to make your life easier. This is our commitment to being a customer driven company that realizes the value of partnerships we create. Our dock lifts are manufactured to save space and designed for a more efficient, safer work environment. Our goal is to exceed our customer's expectations in quality, delivery and value through continuous improvement and customer interaction. Metro Hydraulic Jack Co. is a premier distributor of high quality dock lifts. We can also customize hydraulic systems at our 17,000 sq ft warehouse in New Jersey. Browse our extensive catalog of hydraulic lifts and accessory equipment on our website or call one of our experienced support staff for help. Loading docks, or loading bays, are areas, usually associated with commercial and industrial warehouses, where vehicles containing goods are loaded and unloaded. They may be on the warehouse exterior, fully enclosed in the warehouse or flush with the building envelope. Loading docks usually provide workers with direct access to staging areas, freight elevators and storage areas. Dock lifts are component of loading docks, designed to assist in the functions of shipping and receiving, promote efficiency and discourage product damage and injury. They do so by making sure that a delivery vehicle connects completely to the dock, so it can transfer goods without a hitch. Specifically, they permit platforms to be adjusted and create a bridge between the delivery vehicle and dock. Dock lifts perform much like dock levelers, which are movable floor extension or ramps that are permanently installed in loading docks to accommodate transport of goods or cargo. They may be powered by any number of mechanisms, including springs, pneumatic or air-powered systems or hydraulics. While dock levelers are operational, dock lifts are a better choice because they are mobile and because, operating much like scissor lifts, they reach much greater heights. (Scissors lifts are a very common type of lift table that form a diamond, scissor-like shape when extended via their linked and folded supports. They are commonly powered by hydraulics, but they may also use mechanical or electrical power.) Usually, dock lifts are made from stainless steel, a steel alloy that is at least 10.5% chromium by mass. Stainless steel is generally the best choice because it is strong like ordinary steel, but has increased durability, corrosion resistance, rust resistance and stain resistance. 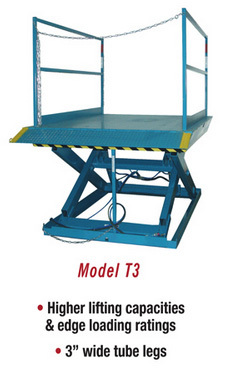 Some other types of lifts include: portable or mobile lifts, hydraulic tables and lifts, forklifts and lift tables. They all offer different benefits to the applications they serve, which mostly exist on industrial and manufacturing factory warehouse floors. 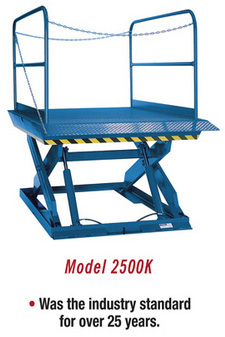 In addition to vehicle loading, lifts commonly assist with pallet handling, work and materials positioning, the movement of large, heavy loads, mobility impaired access, ergonomic handling and roll cage. Industries in which one can common lifts include: heavy machinery, metalworking and woodworking, paper, printing and publishing, transportation, upholstered furniture manufacturing and goods distribution. Other components of loading docks, which work with dock lifts to provide a safe and productive load transfer process, include: bumpers, dock seals, vehicle restraint systems, dock lights, indicator lights and loading dock software. Bumpers, which may be laminated, extruded, molded or steel faced, protect the dock from vehicle damage and can also be used a visual aids by vehicle drivers when they are backing up. Similarly, dock seals are compressible foam blocks against which delivery trucks can press when parked. They may be used for interior parking or exterior parking; in cold climates, they shield delivery trucks from the elements. Vehicle or truck restraint systems, also called dock locks, are sturdy metal hooks attached to the base of dock to a trailer’s frame or bumper. Their purpose is to keep vehicles from rolling away during loading; they either replace or work together with wheel chocks. This rolling movement is known as trailer creep, trailer walk or dock walk; in addition to be dangerous to operations, it has the potential to cause injury to unsuspecting dock or warehouse workers. Dock locks can operate with the help of electrical, hydraulic or manual systems. Next, a dock light is a movable, integrative light that is positioned inside the loading dock in order to illuminate the inside of the delivery truck as it performs loading operations. Likewise, indicator lights tell truck drivers when to pull out of or back into the dock. Finally, loading dock software is an optional feature of loading docks that provides a digitized method for tracking and logging loading dock activity. To solidify and deepen the efficiency and safety cultivated by dock lifts, loading dock operators would do well to provide their workers with a safety checklist and to enact safety precautions. Safety precautions include consistently double-checking dock locks and identifying walkways barriers, doorways, overhead obstacles, etc., with bright tape. Despite the fact that there are many pieces to the function of the loading dock puzzle, it may be that dock lifts are their single most important component; without the secure connection that they provide, all the other dock features would be meaningless. They are the perfect equipment for warehouses that cannot reach proper heights otherwise and their efficiency cannot be overstated. To add value to an application, reach out to a manufacturer who responds well to your application wishes and requirements. Disappearing Dock Lift – Advance Lifts, Inc.